The LFO page features the following parameters: The LFO Power button in the upper left-hand corner allows you to turn the modulation slot On or Off. Next to it is the LFO dropdown menu button. Here you can choose either LFO or Step modulation. You will see a Retrigger button in the upper right-hand corner. When the Retrigger button is On (Note Retrigger), every MIDI note-on resets the phase of the LFO. In the Off position (Phrase Retrigger), the first MIDI note-on resets the phase of the LFO and runs continuously as long as it is held down. Under LFO Power is the Wave knob, which allows you to select from six different shapes of LFO waves. Next to it is the Sync/Free toggle. In Sync mode the modulation signal rate is a division of the host tempo, while in Free mode the modulation rate is set in Hz (free running).The Rate knob allows you to select the speed of modulation depending on the Sync/Freesetting. On the bottom left-hand corner is the Attack knob, which allows you to apply Fade In amount, in (ms) milliseconds, for the LFO wave to reach its full amplitude. The Phase knob determines the amplitude and position the LFO will start at (X axis). Chaos allows you to apply a random amplitude value onto each cycle of the LFO. 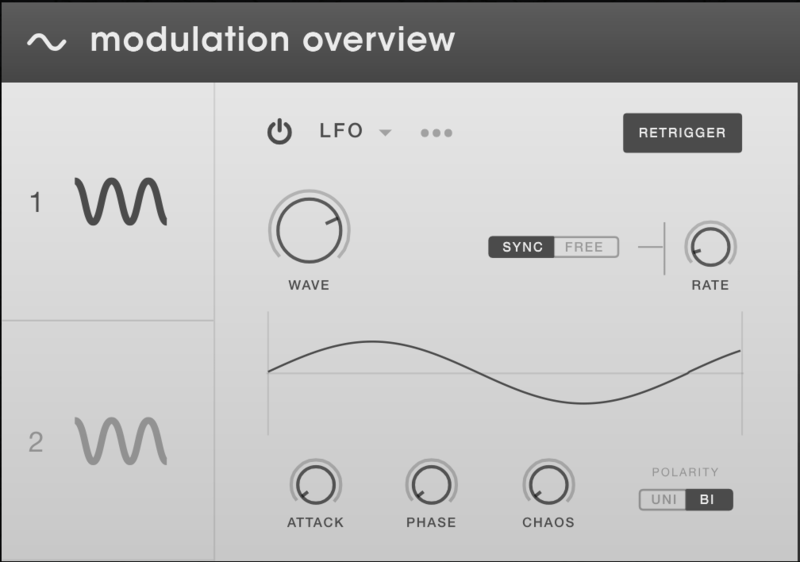 The Polarity allows you to set the LFO to Uni (unipolar) or Bi (bipolar) offset on the Y-axis.